There's a little Hollywood psychotic in all of us, so why not let him out at work with the Mixed Messages Mug? 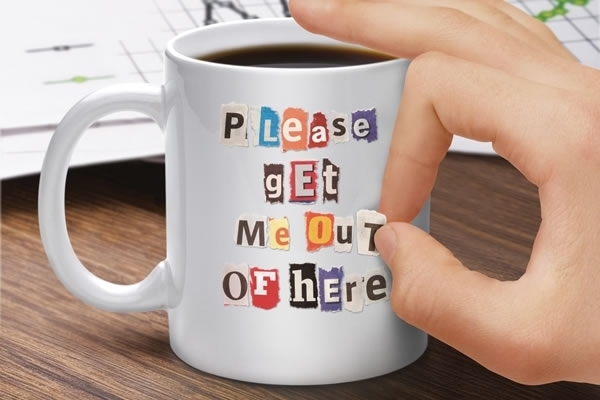 The white mug comes with a set of letters that look as if they have been crudely cut out of various magazines and newspapers, just like ransom notes in movies. It's the perfect way to discreetly get your Doctor Lector on and you don't even have to eat anyone's liver, but feel free to drink the Chianti. We won't tell. 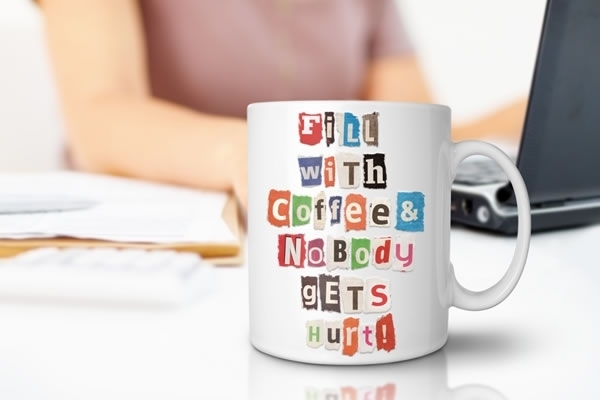 The letters stick to the mug reliably even after multiple washes, so feel free to let people know that if you get some coffee no one gets hurt. How many times have you gotten a coffee mug as a present and thought, “When am I ever going to use that?” Maybe the saying on it just didn't fit you or was inappropriate for use in the workplace. 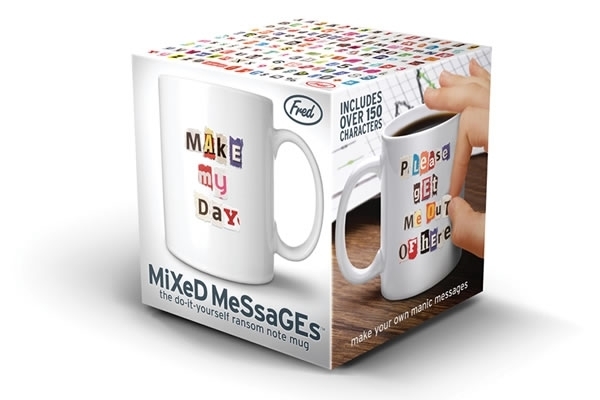 The Customizable Coffee Mug lets you express yourself exactly as you wish, because you get to pick the message. It can be as tame or as dirty as you want, so don't hold back and let your bathroom poet speak freely. - Measures 4" x 3" x 3-3/4"
Anyone who loves coffee in the morning will appreciate the versatility of The Customizable Coffee Cup. He can write a surly message when he wakes up cranky in the morning or brighten the breakfast table with daily affirmations to keep his spirits up throughout the workday. 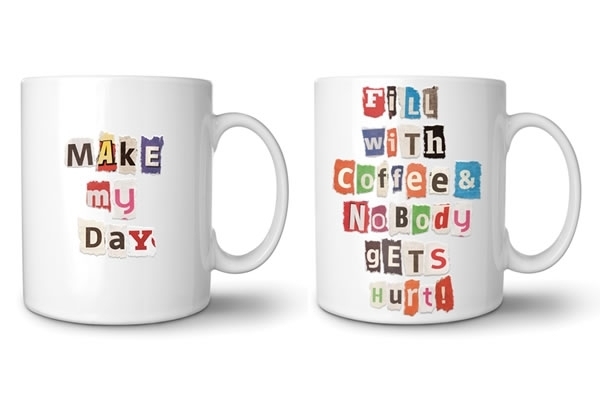 There is no limit to the fun someone can have with The Customizable Coffee Mug. Is this suitable for work? Of course, it is. While I wouldn't suggest adorning it with dirty limericks or disparaging remarks about your boss, there is nothing wrong with bringing this to work. There are so many safe sayings you can choose from or make up on your own. You can even label the cup as yours to keep coworkers from taking it for themselves. My child learned a dirty word from my cup and my wife is mad, what should I do? First of all, fess up to it. You may have accidentally used the cup to tell a dirty joke and forgot to take it off, but don't let your kid take the fall. Promise you'll never do it again and when you do, make sure you look twice as sorry. The third time means you'll probably get the cup confiscated. I absolutely had to buy this mug for myself and my mom- we are both HUGE coffee lovers and love a great coffee mug...we LOVE, LOVE, LOVE these mugs and have had quite a few laughs at making our own messages on our mugs! Coolest coffee mug ever invented! Loved it so much that I bought one for the office and home. It�s even funnier when a coworker spells something out when I�m away from my desk. Will definitely be buying more!